If urbanity had to be weighed, a school of architecture would weigh more than a soccer field, less than a train station but more than a housing complex. What is questioned here is how much urbanity can a programmatic building create. Urban-maker buildings not only create potential spatial links within the existing urban fabric, but also encourage occurrences of unpredictable programmatic events that will inevitably appear in coming years. Through the content of its program and its spatial place in the city, an architecture school is part of a category of dynamic event-creator buildings. As such, it is capable of emulating, intensifying a cultural and social transformation that is already happening. It is about creating processes instead of objects, behaviors are generated instead of shapes. It transforms architectural design methods into forms that are less and less existing in a static state. It is more an instance, an occurrence. Form happens. Tha Aarhus school of architecture is located on the intersection of the cultural axis of Aarhus – including the botanical gardens, the old town and the Kunstham Aarhus – and the newly projected Aarhus K urban area. Building the new school of architecture in the same time of thinking an extension of the city is an exceptional opportunity. It allows a careful adjustment of the buildings’ scales. 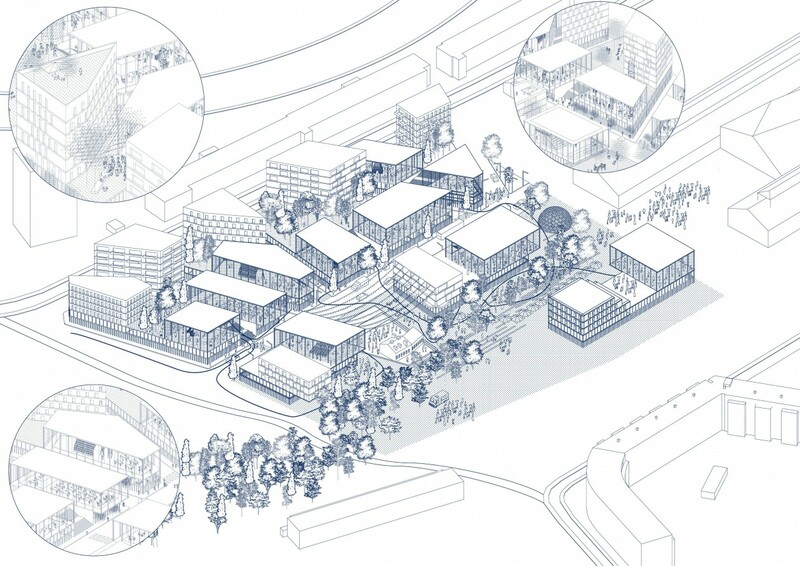 Formal mixity enriches the urban landscape by offering new spatial links opportunities. Instead of building one large self-sufficient building, the new AARCH is made out of a series of smaller buildings spread all over the urban blocks of the new Aarhus K area. On one hand, the school is split into smaller entities while on the other hand, its urban impact is increased manyfolds. Public space becomes an integral part of the project. – A structure that is clearly defined, fully understandable, allows for an easier transformation of the building in coming decades, centuries. – Different ceiling heights allow a heterogeneous use of the building as well as an easier adaptation to future demands. – A twin wall façade system ensures a thermal comfort while the interior plan space division is left free. – The porosities with the public space inscribe the building in its urban context, encouraging socio-spatial links with the city. 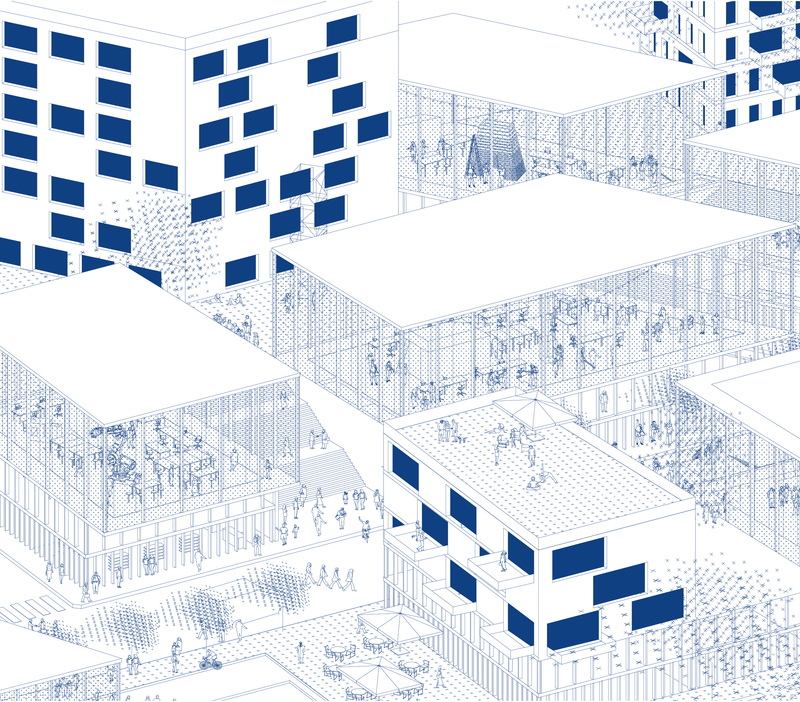 Thinking of the project at the premises of an urban development plan is a way of questioning the role of a school of architecture in the city. The urban blocks are shaped bearing in mind the presence of the school of architecture. Two levels of public spaces dialogue with the school’s functions. The lower floors in direct relation with the street include administration offices, print shop, the library while the upper volumes – in relation with a planted semi-public space – house workspaces and workshops. The new AARCH is a repertoire of buildings that are thought as generators of urban transformations. 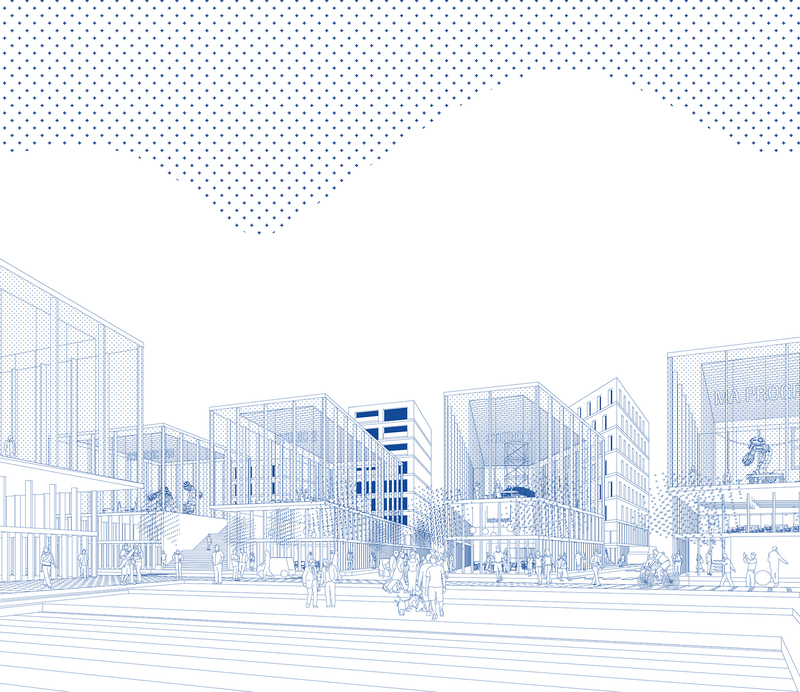 The proposed project seizes opportunities to offer to the city relatively small-scale buildings — built on flexible architectural principles — whose transformations are sustainable.